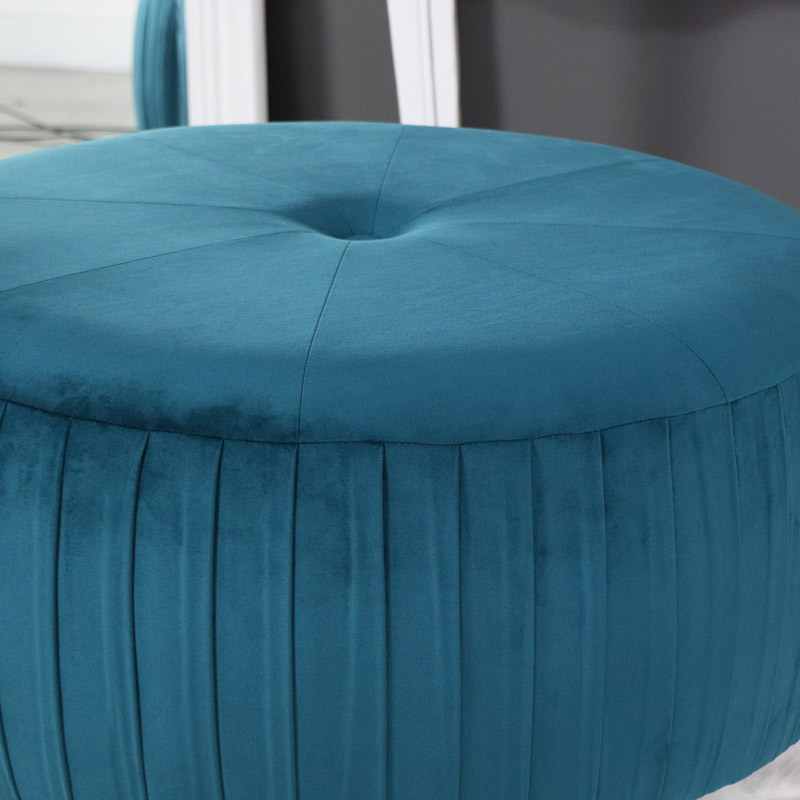 This luxurious teal velvet foot stool / pouffe is perfect for adding a classy and sophisticated feel to your décor and will enhance the glamour you want to achieve in your living room or bedroom. Around the edge of the circle pouffe is pleated to add to the elegant look which is met with a single deep circle button in the centre and the whole piece sits on four black painted wooden feet which compliments the pouffe. The Pouffe is firm but gently cushioned on top for comfort and is multifunctional as either a foot rest, an occasional seat if you have guests over or place a tray table on top if your lacking a place for drinks and books. 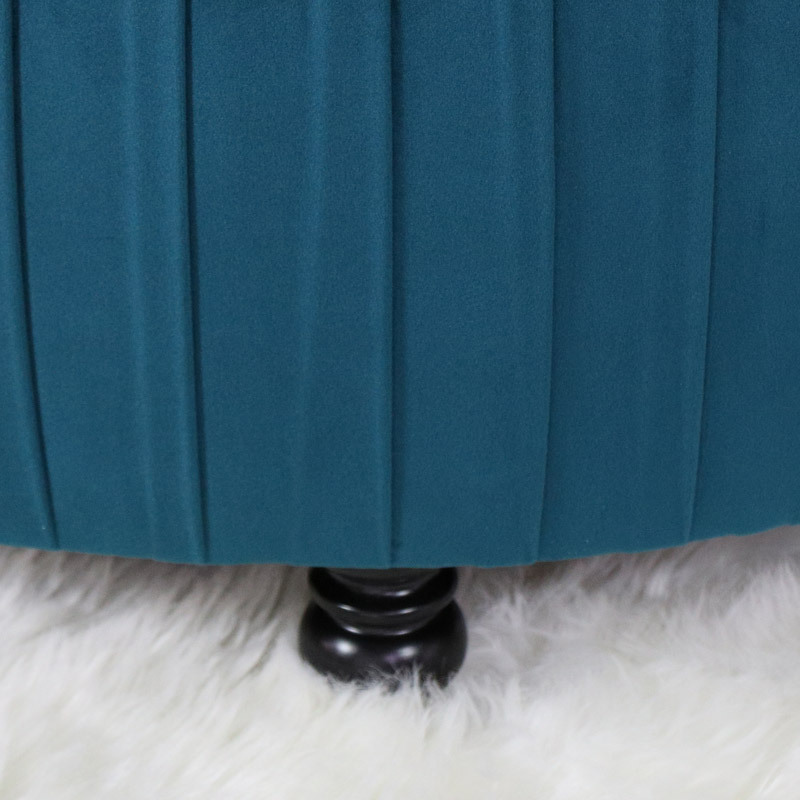 This luxurious teal velvet foot stool / pouffe is perfect for adding a classy and sophisticated feel to your décor and will enhance the glamour you want to achieve in your living room or bedroom. Around the edge of the circle pouffe is pleated to add to the elegant look which is met with a single deep circle button in the centre and the whole piece sits on four black painted wooden feet which compliments the pouffe. The Pouffe is firm but gently cushioned on top for comfort and is multifunctional as either a foot rest, an occasional seat if you have guests over or place a tray table on top if your lacking a place for drinks and books. The feet are not pre-attached but simply screw into the pre-made holes in the bottom of the pouffe.